In his nomination of Representative Mike Pompeo to head the CIA, President-elect Donald Trump has picked someone who has supported NSA surveillance programs and has criticized Silicon Valley's stance on encryption. Pompeo, a Republican from Kansas, is a former cavalry officer in the U.S. Army and a graduate of West Point military academy. He currently serves on the House Intelligence Committee and is perhaps best known for his role on the Benghazi committee that investigated Hillary Clinton. But his committee assignment has also put him in the middle of several recent issues that have pitched the U.S. intelligence community against major tech companies. Back in February when the FBI was fighting Apple to gain access to data inside an iPhone used by a San Bernadino mass shooter, Pompeo criticized the company's position. Pompeo called Apple CEO Tim Cook's resistance to a subpoena "disappointing" and said he "should not stand in the way of the FBI’s investigation into a dead ISIS terrorist, who has the blood of 14 innocent Americans on his hands." The FBI had asked Apple to create custom software that would allow it an unlimited number of attempts to crack a passcode on the phone. Apple refused, and the case ended unresolved after the FBI said it had ultimately gained access to the iPhone using other methods. Pompeo has also supported the National Security Agency's decision to run some of its expansive surveillance programs that came to light after Edward Snowden, the former NSA contractor, leaked secret documents to media organizations. In the face of widespread resistance to NSA domestic data collection, Pompeo opposed limits and argued that the agency's surveillance programs are essential in fighting the threat or terrorism aimed at targets in the U.S. He has also been a constant critic of Snowden. Commenting on his committee's report into Snowden, Pompeo called him "a liar and a criminal" and said, "the appropriate action would be to send Snowden to prison, not give him a pardon." Back in 2014, he pushed the organizers of the SXSW conference to cancel an event where Snowden appeared via video conference. In making his choice, Trump said Pompeo "will be a brilliant and unrelenting leader for our intelligence community to ensure the safety of Americans and our allies." His nomination will need to clear the Senate, and there will be some resistance. In response to the nomination, Senator Ron Wyden, a Democrat from Oregon, said the CIA needs "principled leadership now more than ever." Wyden criticized Pompeo's support for torture of terrorism suspects. 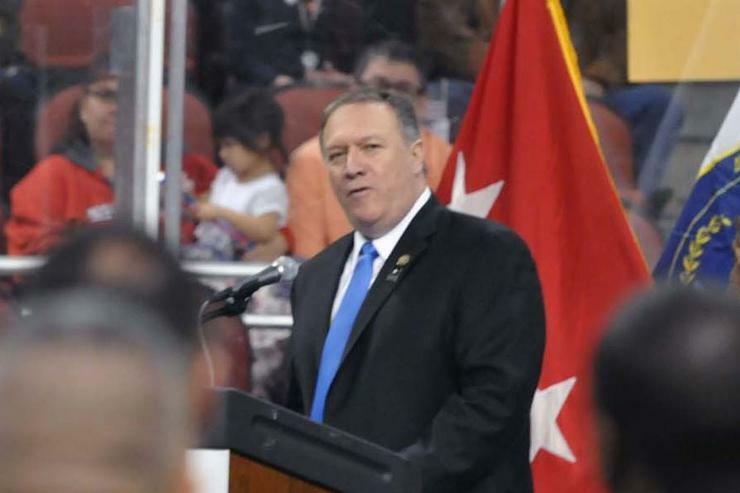 "Unfortunately, Representative Pompeo’s comments in which he asserted that the CIA’s torture program was legal and that the American people did not deserve to know about it are deeply troubling," Wyden said.